Disclaimer: All (at least most) of this information was taken by force. If you do not like it, suffer a little. And DO NOT write to me about it. Instead, yell to your friends about it....getting back to the important stuff....please do not copy any of the stuff you see here because most of it will be false (except the "unofficial" part). And remember, turds are not something you play with...that is what the bathroom plunger is for. One more thing, "¿Dondé esta el banó?" and "¿El banó es dondé?" are the same thing. The real Bill Nye (by the way, that is his real name) site is here. So go there for real information. To see some REALLY cool 3D Molecules (all of which can be rotated around on the page by dragging them in various directions), click here! Every tool he uses MUST end with "of science!" and if it doesn't, the tool isn't important. If you see him holding something that looks explosive, it usually is. If you see him holding something that is expensive, it will soon break. As a kid, he was teased a lot for wearing a funky bow-tie; and he wasn't born with a "silver spoon", he was born with a "bow-tie." 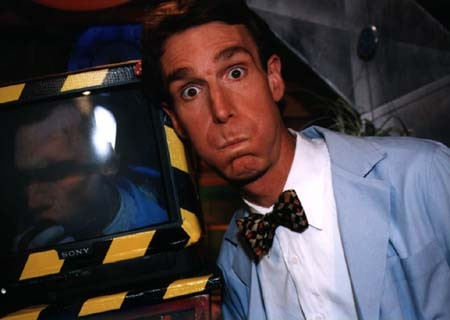 If you ever hear someone saying that they are going to watch a "William," that means they will be watching Bill Nye. Bill Nye's jokes are so stupid, they are funny. Even though you need to do just the right thing to open the "Lab Door Of Science", you could just walk around it, but nobody on the show realizes it. Click on the image to see the stats for this page. These are just some silly pictures of the one-and-only Bill Nye. Most of the information/pictures that I used was found at PBS's Home Page..